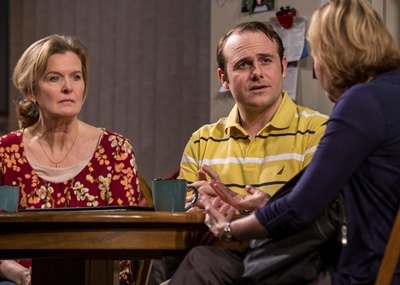 Interview: Actor calls portrayal of agent grappling with troubled young parents and inadequate system a privilege, in world premiere of Rebecca Gilman’s play at Goodman Theatre through Feb. 23. 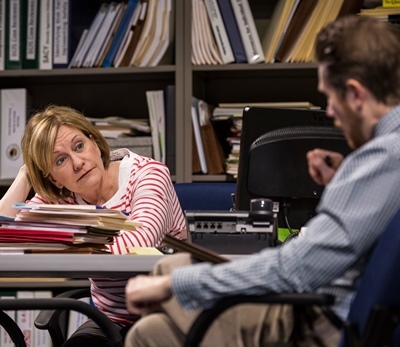 Mary Beth Fisher, who portrays the empathic, long-experienced and raggedly weathered social worker Caroline in Rebecca Gilman’s new play “Luna Gale” at Goodman Theatre, says every performance has been an interactive encounter with the audience. “I can feel them leaning forward, from the beginning of the play to the end,” says the actor. “I can feel people judge the people Caroline encounters – then Caroline herself. And then I feel them reassessing their judgment. In large part, no doubt, because of Fisher’s mesmerizing performance as a no-nonsense but emotionally vulnerable social worker caught up in a poignant case involving teenage parents, unmarried and drugged-out, who’ve just had their neglected child taken from them. If the young parents, Peter (Colin Sphar) and Karlie (Reyna de Courcy), are to get their infant back, they must clean up their apartment and have drug counselling. Rehab would be ideal but the municipal treatment center (this is set in Cedar Rapids, Iowa) has a waiting list. Meanwhile, the girl’s mother (Jordan Baker), a born-again Christian, is taking steps to gain permanent guardianship of the baby. And Caroline’s new boss (Erik Hellman) is on-board with that idea as a good and practical way to remove one case from their ever-growing backlog. But Caroline wants to see the young parents reunited with their child, and believes it’s the better objective. She also discovers deeply troubling issues in the young mother’s own upbringing. “When Karlie straightens out somewhat and Caroline gets a grip on the girl’s family and background, she begins to put together a more complete picture – and starts to see red flags that she recognizes on a clinical level, but also on a personal level. If this girl, with her history and her dependency on drugs, loses her daughter, she also will be lost. And Caroline develops a determination that this is not going to happen. Central to “Luna Gale” is the issue of child sexual abuse. Fisher said she was shocked to discover the high incidence among American children, as reported to her by social workers she consulted. According to the National Center for the Victims of Crime, an advocacy group for rights, protections and services for crime victims, 1 in 5 girls and 1 in 20 boys is a victim of child sexual abuse. The center’s website states that experts agree the incidence is far greater than what is reported to authorities. The perfect, summary compliment, Fisher says, came from her sister — who is not an actor — when she declared that “no one seemed to be acting.” That level of transparency didn’t just happen, notes the actor who indeed seemed not to be acting. It was achieved through the painstaking work of theatrical osmosis. Fisher lays credit for that at the feet of director Robert Falls. The process of getting to that point, as Fisher recounts it, involves the minute back-story detail work and personality melding at the essence of acting technique developed by Constantin Stanislavski in the first decades of the 20th century. “We covered the walls of the rehearsal room with paper and created timelines of when every character was born, went to high school, when they starting smoking meth, found Jesus, got divorced. We identified every single person mentioned in the play – including characters you never see – and named them. We mapped the city of Cedar Rapids, located the hospital and the places where everyone lived. Not that anyone was going to drift off that track: Along with Falls, the playwright also was on hand from the get-go for this world premiere, watching her new work take wing and making textual adjustments on the fly. Caroline’s heart-rending speech about the overwhelming number of kids in need of help was written during rehearsal, Fisher said.